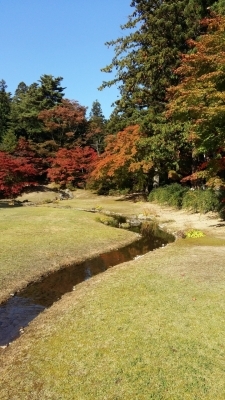 Hiraizumi–Temples, Gardens, Archaeological Sites Representing the Buddhist Pure Land comprises Buddhist properties enshrining Amida Buddha and gardens made for the purpose of representing a Buddhist Pure Land. he Ôshû Fujiwara family turned Hiraizumi into the political and administrative centre of the northern realm of Japan at the early 12th century. 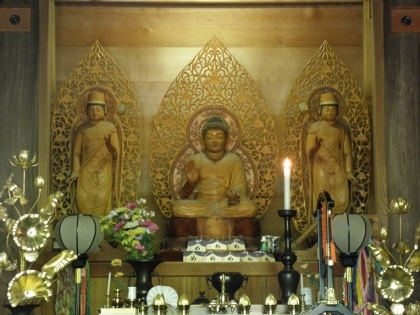 The rulers set about constructing a country based on Buddhism, of which Hiraizumi was the main city. Its layout is seen as reflecting the cosmology of Pure Land Buddhism. Chûson-ji - temple and buried garden remains. This was the spiritual heart of the city. 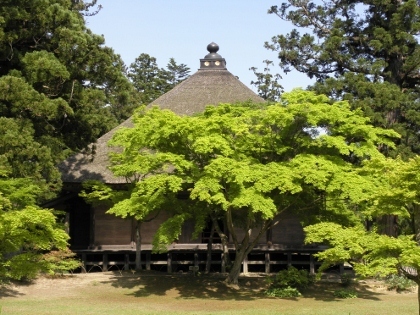 The main surviving 12th century building is the Chûsonji Konjikidô (Golden Hall). The building later became a mausoleum in which are the mummified remains of four lords of the Ôshû Fujiwara family. Môtsû-ji – temple remains and reconstructed garden. The garden layout contains a variety of elements such an island, cove beach, cape, vertical stone and a 4 metre high artificial hill. Muryôkô-in Ato – archeological site of temple and buried garden. The sacred Mount Kinkeisan – nearly 100m high and a central reference point for constructing the city. I started my visit to Hiraizumi with a smile on my face after the friendly welcome at Hiraizumi railway station: the seats are heated at the public toilets, there are coin lockers to get rid of any unnecessary luggage and there is a tourist information which hands out all kinds of folders and maps in English. I needed it after having been on a crowded train from Tokyo sandwiched between a fat older man and a sleeping salaryman. And then I headed off into town – a very prosperous-looking town that is, just as Frederik noticed below. It’s about 10 minutes walk to the first of the 5 inscribed locations: Motsuji Temple. This is mainly known for its garden, a large landscape garden centered around a lake. I was blessed by great weather, which added to the fine composition. I also loved the building with the thatched roof at Motsu-ji. I had read in the AB evaluation that “visual links between sites are compromised”. It sounded like overreacting to me to lament about electricity poles, but I was annoyed also when one of those kept showing up at my photos of Kanjizaiô-in Ato. 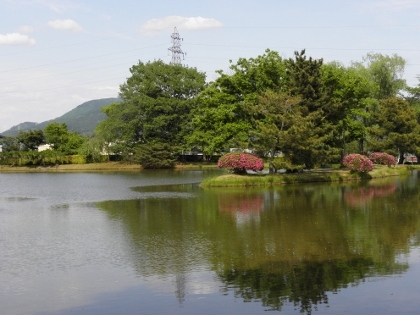 This is a smaller pond, close to Motsu temple. After visiting the world heritage center, which has some interesting displays, I climbed up to Mount Kinkei. This “sacred mountain” fortunately isn’t even 100m high. There’s not a lot to see, which is also the case at Muryôkô-in Ato: an archeological field on the other side of the railway tracks. After having visited 4 out of the 5 inscribed parts, I took a taxi to bring me to Ryokan Shizukatei for the night. This fine traditional Japanese hotel lies some 8 kms out of town, amidst the rice fields. I received a heartily welcome, and was pampered from that moment on with great food and a Japanese bath. The next morning, the ryokan owner dropped me at Chuson-ji. This is the main temple complex, and I thought I had saved the best for last. It consists of many wooden temples and other buildings. The thing to see here is the Golden Hall. This unfortunately is encased in a protective building. After paying the 800 Yen (8 EUR) entrance fee, I felt that I entered a museum. It is also not allowed to take photos of it. It’s a brilliant piece of work however, imagine how it would be if it still stood outside among the trees and the other temples. In general though, Chuson-ji did not live up to my expectations and I rate Motsu-ji with its great garden as the best sight in Hiraizumi. The first Japanese gardens I saw on my visit to Japan was in Hiraizumi. It takes a while to fully appreciate the artistry of a Japanese garden, so initially I felt somewhat underwhelmed. The gardens are small in scope and at first note seem random. It was only after I had seen more of the gardens all across Japan (Kanazawa, Kyoto) that I was able to grasp that most of what I was seeing was not random nature, but planned and arranged to look natural. Back home I looked at the pictures and those from Hiraizumi stood out. The site is spread across the city. There is one trail where there is a bear warning. The temples are fine examples and I felt that Hiraizumi was a good start on my Japan trip. Hiraizumi is a bit off the average travellers itinerary for Japan. But equipped with a Japan Railpass and relying on the excellent Japanese high speed rail network it's easily feasible as a relaxed day trip from Tokyo (Ueno). In Hiraizumi itself you can do everything on foot. Located in the Tohoku or Northern Japan that severely suffered from earthquake and tsunami in 2011, Hiraizumi was selected as a World Heritage Site, since then the government used the inscription as the symbol of hope of this region. From Matsushima, a beautiful bay near Sendai which was hit by tsunami, I took a train to Hiraizumi. After kept my luggage in the coin-storage, I walked from the very lovely train station to Motsu-ji Temple. The town itself looked very clean and new, hard to believe its status as historic town, I thought this was the result of World Heritage Site beautification process. After short nice walked I was at Kanjizaio-in, the temple ruin was actually a large lawn with some trees and bushes around a pond, a fine place but nothing remarkable. Motsuji Temple was my next destination, as I visited in March, this ancient garden turned to be the ice rink! However, the garden was lovely and photogenic with stones and pebbles around the pond similar to many Zen gardens in Kyoto, the most important part of the garden was the standing rock, if you saw some old photograph, you may noticed that the rock had been changed its position! Then I took the bus to Chusonji Temple, the bus system of Hiraizumi was really well designed for tourists, there was a loop line called Run Run Line (pronounce like “ruin ruin” and be careful there is another bus line called Ran Ran Line that connect Hiraizumi with nearby town of Ichinoseki and pronounce like “run run”) and the bus connected all World Heritage Sites together, and with Day Pass at 400 Yen could save a lot of money and time. As Chusonji was located on the high hill, the entrance pathway was surprisingly steep thru the pine forest. Along the way, there were many old wooden shrines and buildings which were quite lovely but nothing unique compared to other similar hill top temples in Japan. The main attraction was the Golden Hall of Konjikido which located behind the glass wall, was quite small than I anticipated, but it was pretty amazing to see such brilliant gold building with many lovely details and looking it was quite spiritual enlightenment. After Konjikido, I saw its old storage building and a museum which kept many artifacts, one of most remarkable was the Buddhist Bible written in silver and gold. By the small down hill road next to the museum, I went to see the ruins of the paradise garden; the garden was quite similar to Kanjizaio-in, however much smaller. 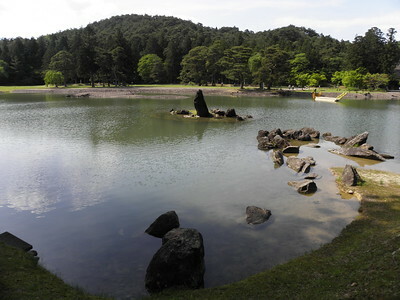 Muryokô-in, this site again similar to the other was an empty space with some stones and very shallow ponds. After visited all those sites, the best site I saw was Motsuji since it reminded me the garden of Byodoin in Uji which was another World Heritage Site and was constructed in the same period and by the same Fujiwara Clan. For Konjikido Golden Hall, it cannot be considered unique as Japan has another golden building, the famous Kinkakuji, also in East Asia, there are many golden halls which are bigger than Konjikido, but as I mentioned, it was truly amazing piece of art and should be seen. In my opinion Hiraizumi was quite a mix of Kyoto temples in the location of Nikko. All in all Hiraizumi was a fine place, in the region which quite lack of significant cultural sites compared to other parts of Japan, Hiraizumi could be a nice place to visit. I recommended combining Hiraizumi trip with Matsushima and Yamadera which was considered top three cultural sites in this region. Gold Surfaces: Chusonji's Konjikido Hall have gold leaf covered all inside and outside the building. Marco Polo: "Some say that accounts of the sparkling light reflecting off the Konjiki-do led the Venetian traveller Marco Polo to describe Japan as a land so rich that all the rooves were made of gold." Part of Cultural nomination rejected: The Yanaginogosho Iseki (site of government offices) was part of the nomination too, but has been rejected at inscription because it had no link with the Pure Land and had no OUV of its own. Reduced from broader TWHS: After an deferral in 2008, the number of designated locations shrunk from 9 to 6 (and finally to 5 inscribed).